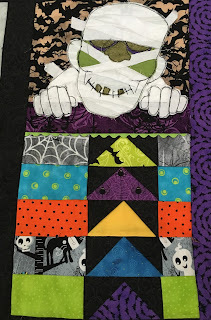 I am so excited to share with you my EERIE project, but first a big thank you goes out to Marian Pena of Seams to Be Sew for organizing this hop. And another heart-felt thank you goes to the Amy Warner of Sew Incredibly Crazy for hosting. And not to be forgotten, a huge thank you to our sponsors for providing the great prizes in our giveway. It's no secret Halloween is one of my favorite holidays. I love the weather, the smells, the spooky displays, and of course the spirit of fun. So I was thrilled when Marian announced she was organizing a Halloween Blog Hop and I had to join. I thought long and hard about my project. I wasn't sure if I wanted to make a full-size quilt or a wall quilt or just a table runner. 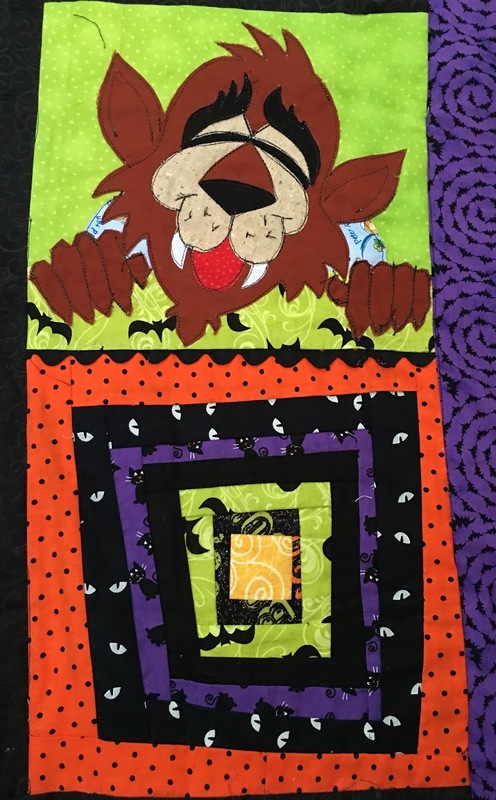 As I was rifling through my Halloween fabric stash, thinking about all the traditional Halloween characters, I wondered what types of quilt each monster slept under. Voila! I had my project. 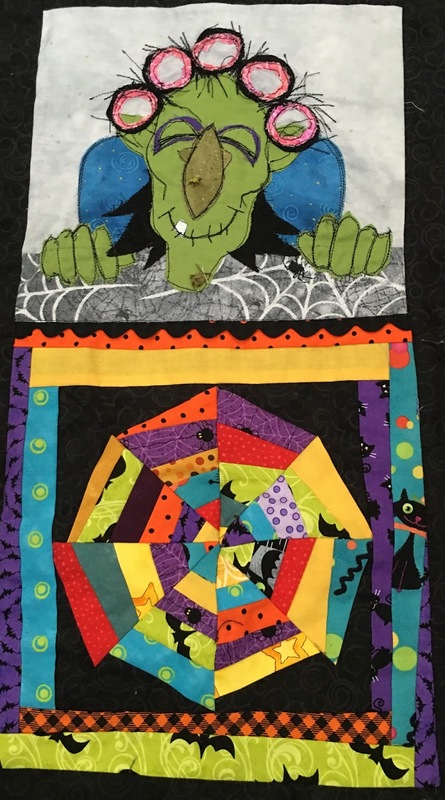 At first I was going to make a wall hanging of four monsters under their quilts, and then it was five, and finally I decided to chuck it and make a full-size quilt of six. All of the monsters' quilts are pieced. The monsters are appliqued onto the quilt using the raw edge applique method. Because I wanted their features to really stand out, I outlined their faces and hands in black several times. To give more of an illusion that my monsters were tucked in for the night, I added a topper with an owl sitting on a branch under a big yellow moon. 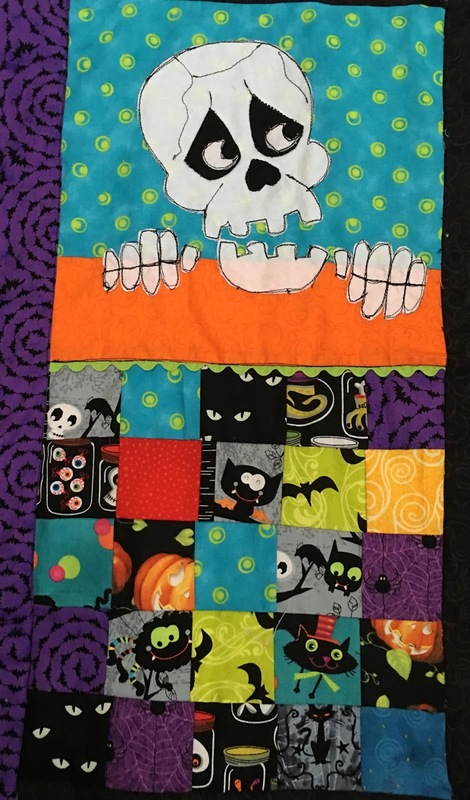 To even the quilt out, I added a bottom panel of orange pumpkins against a black background. These panels used the raw-edged appliqued method as well. This quilt was a lot of fun for me to make because I made it up as I went. I drew all of the characters and pieced their individual quilts in a haphazard manner, purposefully making them all a little off-kilter to give them an eerie appearance. I hope you've enjoyed seeing my quilt as much as I did making it. 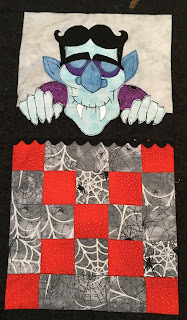 Be sure to visit the other bloggers who are revealing their Eerie projects today. And be sure to enter in the giveaway! I love it! I want to make it! Are you going to make it into a pattern? It's just too adorable for words, even down to bedtime curlers! 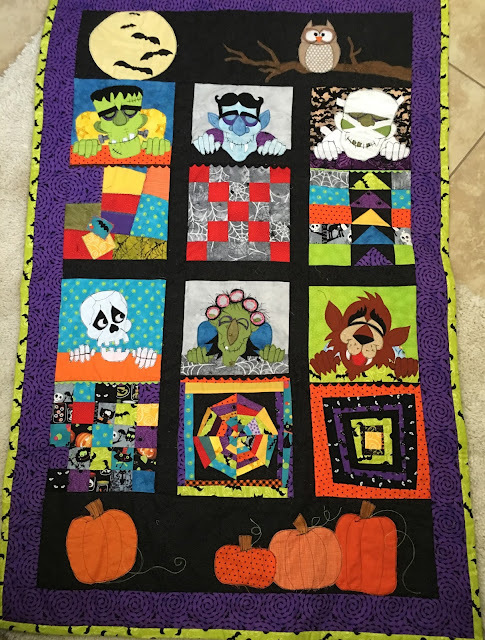 What a wonderful way to create a spooky quilt. Very creative idea. love it. Awesome quilt, it is fantastic! You have been very creative, and I wouldn't mind sleeping under these monsters every night; love it! Wow this is amazing! Personally I like the cute Halloween better than the scary stuff. This is fabulous! Love each character and their quilt! Great idea-your quilt is fantastic! Amazing quilt; Great concept and design! I love how you incorporated different patterns for each of their bed quilts. That is SO CUTE! I love the idea and I love the designs. Awesome work! I loved reading about your creative thought process on this project. You have the wonderful skill to put it together and must have a great stash of fabric too! Thanks for hopping and for blogging. Love it!!!!!! You were so creative with this piece...great job!!!! What an amazing quilt! Each character has such personality! Love it! Thanks for sharing with all of us. Oh My Goodness! The quilt is too cute. I love each of the characters in it and their little quilts. You did a fantastic job making each of them. Thank you for sharing. This is one of the cutest ideas I've seen for Halloween. Something new and different. Great job. 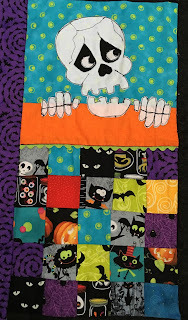 I love this quilt and all the details you added!This is my kind of quilt! Your monsters are fabulous. LOVE the witch in curlers. Wow, is this creative! 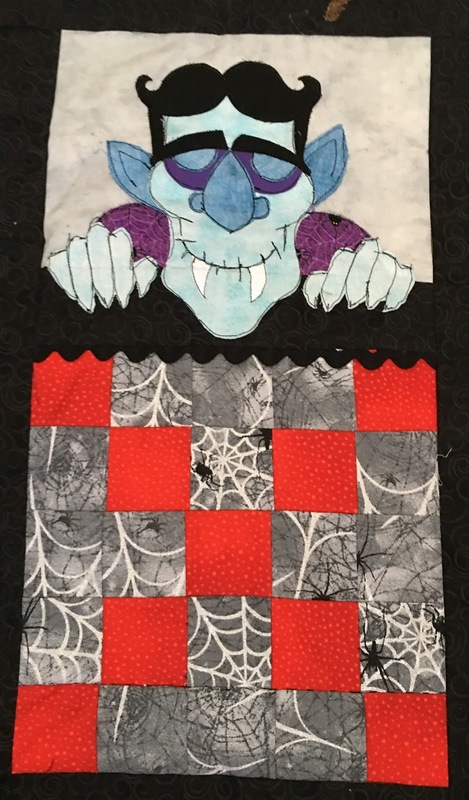 From the idea of it to the completed project, what a fun quilt! This is darling, at first I thought it was pillows on your couch. It is just too cute and I would make pillows to. Well I'd like to think I would anyway. That is so cute! I may have to put this on my list for next year. Charlene, your quilt is fabulous! 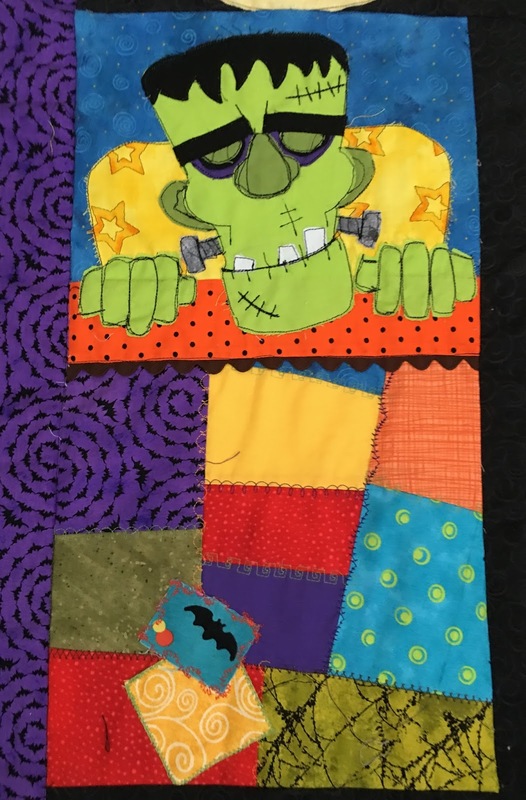 Your monsters with their quilts are fantastic. The topper with the moon and the tree branch are the perfect setting. What a delightful quilt! This is a fantastic creation! I think I prefer freehand patterns, it is easier to translate the idea to fabric. It helps having an artistic background as you must have also. I love it! Great faces on your monsters. You are very talented. Thanks for sharing. This is such a cute quilt. I just love the design!! Thanks for the inspiration!! Very fun idea. Thanks for sharing and for putting my name in the hat for the giveaway! Oh. My. Goodness. So cute and clever! That is fabulous. I love how peaceful your characters are tucked under their very own quilts. What a creative, wonderful quilt! Love it. Really neat quilt...so so original. Thanks for sharing! What a darling idea! 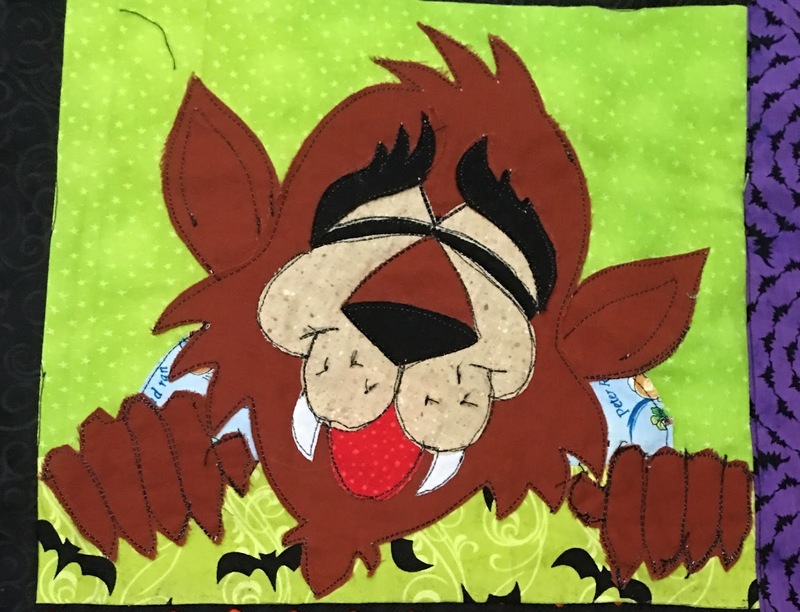 I love the expression on the Werewolf's face--it looks like he is having sweet dreams. Absolutely priceless, to see all the Halloween characters tucked into bed with their very personal quilts!! If your not going to sell that pattern, I hope you will send it, I want one.. 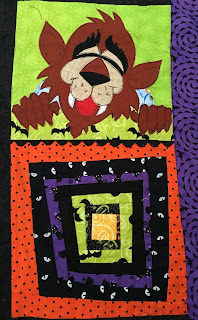 This is absolutely fun fun fun and even more fun.. Love the fabrics, colors, and the characters, and you gave new life to some old traditional blocks.. Way To Go!!! I thank you so much for participating in this hop, you've made it more fun by your amazing project. What a fun ingenious Halloween quilt! You ought to publish the pattern. Wonderful quilt! Love your quilt. I truly think it is the cleverest one I have seen. This project is so unique. Congrats on such a great quilt. Oh my gosh. You are so creative! I LOVE it. A wonderful quilt full of color and whimsy. Love it! So spooooky and fun, fun, fun. I just kept giggling looking at all of them. This quilt is the most fun I've seen in a long time! You are so creative! This quilt is adorable and so much fun to look at. Genius! All your monsters are so cute! Could you please tell me what your pattern is? I love it!!!! Really cute quilt. Tucking monster's in for the night under quilts...brilliant! Your quilt is so clever! I love that you gave all the monsters their own quilts. Great job! What a great idea! This will be a hit with kids and quilters alike. Absolutely darling! My mother in law is a huge Halloween fan and I didn't do anything for her this year but would totally do this for next year. An amazing design that is well balanced with lots of personality and whimsy. please let me know if you make a pattern! These are so adorable! The monsters are scary cute and I love the quilts they are each holding. The result is something truly special. Clever and very creative. Each character done well with matching quilt. Really, really neat! Your quilt turned out so cute! Love your monsters! They are so cute. I love the topper on all your cute monsters. It really -er- tops it off!